Have you ever wondered if Wood Badge, the advanced BSA leadership training course, is for you? The article below is copied from the LDS-BSA October 2007 newsletter, and it and other newsletters and information can be found at http://www.ldsbsa.org/. They have graciously allowed us to copy the article to share with you. 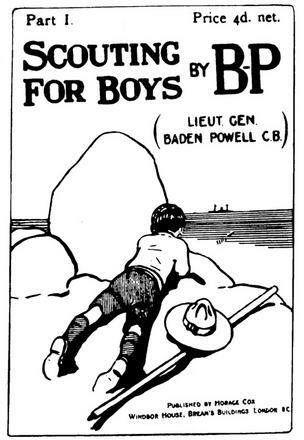 If you signed up for Baden-Powell's first Wood Badge course in the fall of 1919 at Gilwell Park outside of London, you could have learned animal tracking, art, useful knots, and how to cook. And while learning those skills, you would have learned something else. Baden-Powell would have probably helped you to catch your own vision of how to lead Scouts. Catching the vision of how you can be a great Scout leader is still one of the purposes of Wood Badge. Though the course has refined somewhat over the years-art, tracking, knots, and cooking are taught elsewhere-and the course has shortened from the original 12 days to six-advanced Scout leadership training is still the heart and purpose of Wood Badge. And the reward of sharing in this hands-on-experience is catching your own vision of how you can help boys feel the spirit of Scouting and become great leaders. While a Wood Badge course teaches you state-of-the-art leadership principles, I believe the genius behind Wood Badge is that you learn by doing in a patrol setting. You'll acquire leadership tools and practice some models of success, and along the way you'll probably feel something you would like your boys to feel-the spirit of Scouting. And it may change your life. "Wow, where do I find the words to say thank you!? You will never be able to know how much you have affected my life for the good." "My prayer and desire was answered because of your talents, testimonies, work and service. I am so thankful to have been blessed to be here at Wood Badge. My testimony has been strengthened. Thank you!" "Wood Badge changed my outlook on Scouting. I have been converted! Truly converted!! I have felt the spirit many times over these six days and have been taught important principles. Thank you! Not only for me but in behalf of the boys I serve." When you come home from Wood Badge, watch and see whether others notice something different about you. One Scouter shared his family's impression of him after returning to the second half of his weekend Wood Badge course. He wrote, "I just want to say how much this experience means to me. My life is changed for the better. During the break between weekends, my family noticed something had changed. My 4-year-old daughter asked my wife, "What happened to Daddy?" Even my wife asked how many times I could go to Wood Badge so I could keep improving. Thanks so much!" Judging by the experience of others, Wood Badge will help you become a better Scout leader. It's also likely that along the way you'll find ways to become a better person. Sign up soon for your Wood Badge experience. Do your best to serve others by improving your leadership skills. If you do, you'll help fulfill Baden-Powell's vision that Scouting can bring about God's Kingdom on earth. And by going to Wood Badge, that vision can also become yours.